Are you interested in learning about mason bees? 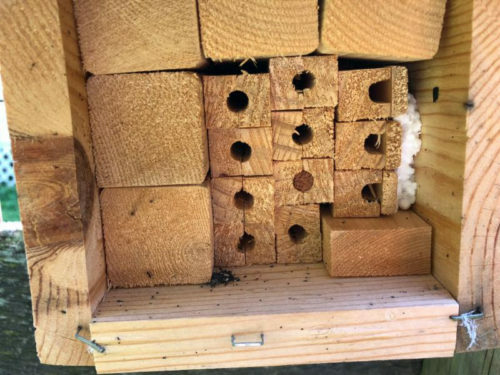 Master Naturalists across the state and mason bee researchers at the University of Virginia’s Blandy Experimental Farm were able to monitor spring-emerging mason bee populations. Over 150 Master Naturalists all over Virginia were involved by deploying bee “hotels” (nest boxes) in 2017 and 2018 and bee bowls (traps) in 2017. This webinar will cover the natural history of spring-emerging mason bees, it will describe our project setup and methodology with a live demonstration, results will be shared, and we will share information for how to participate in the 2019 mason bee monitoring project season. Everyone is welcome to join the webinar. Kate LeCroy is a Ph.D. student studying ecology in the department of Environmental Sciences at the University of Virginia. She is advised by T’ai Roulston, Ph.D., at University of Virginia’s Blandy Experimental Farm in Boyce, Virginia. Kate graduated with a Bachelor of Science degree in Biology from Birmingham-Southern College in Birmingham, Alabama and went on to complete a Master of Science degree in Biology from the University of Pittsburgh studying the community ecology of flower color. Now at UVA, in 2017 and 2018, Kate worked with over 150 Virginia Master Naturalists throughout the Commonwealth of Virginia to document springtime wild bee diversity, particularly the diversity of mason bees (genus Osmia). Kate enjoys interacting with Master Naturalists because of their curiosity, their steadfast commitment to projects, and their enthusiasm for conservation and the natural world. When she’s not out “saving the bees” Kate enjoys spending time in Charlottesville with her husband Riley and their dog, Magnolia.